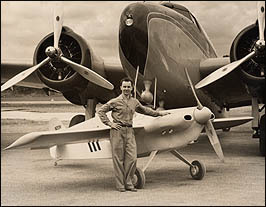 While employed as an airline pilot, Captain Tom Cassutt of Huntington, Long Island, designed and built a small single-seat racing aircraft known as the Cassutt Special #1 in 1954. Based on Steve Wittman's "Buster" design, the Cassutt Special won the 1958 National Air Racing Championships. In 1959, Cassutt completed a smaller aircraft along the same lines known as the Cassutt Special #2. Plans of both aircraft were made available to amateur constructors and as a result many Cassutt Specials were, and are still, being built. The Cassutt was a single-place, cantilevered mid-wing Formula One sport racer. It was a simple to construct steel-tube, wood and fabric airplane stressed for aerobatics to 12 G's. This very popular racing design is inexpensive yet it offers high performance. The fuselage, engine mount, tail and ailerons are constructed of steel tubing. The wing is all-wood with the spar a simple flat piece of spruce laminations. The 18 ribs are identical and of spruce truss construction. The wing skin is thin plywood. This particular aircraft is a one-of-a-kind two-place version begun by Tom Cassutt and finished by Experimental Aircraft Association Chapter 594.